Fright-Rags celebrates 50 years of George A. Romero’s Night of the Living Dead with five t-shirts from the genre-defining classic. Unlike most merchandise from this public domain movie, this merch is officially licensed; Fright-Rags worked with the surviving filmmakers and cast, as well as the estates of those who have passed. Fright-Rags also honor Fangoria’s return to publication with a new collection dedicated to the influential horror magazine. The classic red logo is available on t-shirts and baseball tees, plus blind bagged, mystery logo enamel pins are available; in either red or yellow on Fangoria cover backer cards. 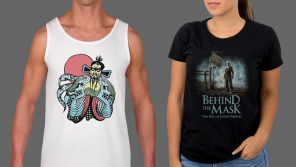 We’re halfway to Halloween, but Fright-Rags are continuing to release high-quality horror movie merchandise all year long. The ‘Vintage Halloween’ collection lives up to its name with Nathan Thomas Milliner’s retro-style artwork for The Texas Chainsaw Massacre, Halloween III: Season of the Witch, E.T. the Extra-Terrestrial and Scream. Each Halloween-themed design is available on t-shirts and baseball tees with orange sleeves. The Texas Chainsaw Massacre, Halloween III, and E.T. designs have also been released as enamel pins.